From this four-wheel drive track Coles Bay, you will get fabulous views over the Freycinet National Park. This 4WD track Bluestone Bay is located in the Freycinet National park - you must have a valid National Parks pass and dogs are strictly not permitted. This is only a short track, off medium difficulty and will only take you 15-20 minutes to complete. This track is considered medium, a 4WD vehicle is required and can be driven. There is a small camping area here at Whitewater Wall however, you will need to be fully self-sufficient. Start this 4WD track at Cape Tourville Lighthouse. Head towards Coles Bay and turn right onto the track app .5 kilometres along the road. This track is considered medium, a four-wheel drive vehicle is recommended. 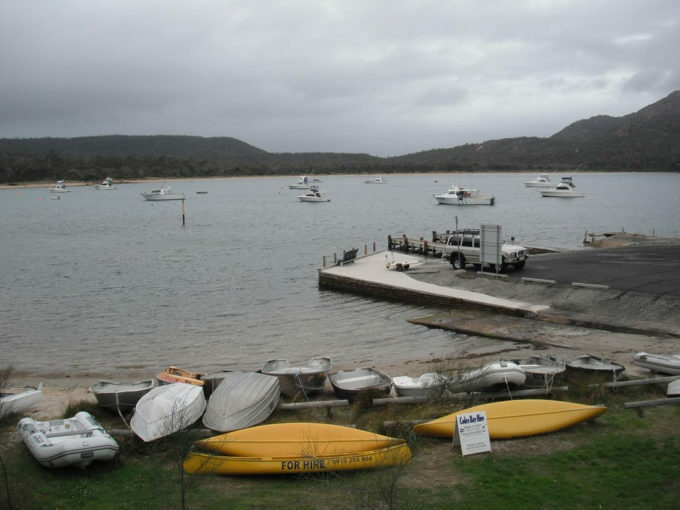 Bluestone Bay is an inlet on the eastern side of Freycinet Peninsula, in the Freycinet National Park and just a few kilometres north of the lighthouse at Cape Tourville. The bay is somewhat different to most of Freycinet given its shore is covered with pale blue and pink boulders. Access is gained by the Bluestone Bay 4WD road, which is a kilometre short of the Cape Tourville lighthouse. The road is quite eroded, so a 4WD vehicle is required. The track is accessible in dry weather.